Ever sat at your desk and thought “the lighting’s terrible?” Or perhaps you’re one of those people who automatically looks up when you first enter a room? Whether you’re a lighting amateur, lighting enthusiast or lighting professional, join the Lighting Europe in Brussels on 21st March 2019 for the LightingEurope 2019 European Lighting Summit to discuss how lighting impacts us and what we should be doing to deliver better lighting for mankind. The event showcases the key pillars of LightingEurope’s Strategic Roadmap 2025 with their challenges and opportunities: Intelligent Lighting Systems, Human Centric Lighting and Circular Economy. From visionary thoughts on the “digital tsunami” that will hit the industry and the business opportunities it creates for lighting systems, to medical research with lighting and EU insights to the objectives of the Circular Economy and the upcoming review of CE marking rules, the agenda offered a unique range of perspectives. More info on program and location to follow early 2019. A highly specialized public, composed of decision makers, buyers, energy managers, plant designers, installers, system integrators, architects, lighting designers, technical offices of municipalities, and lighting designers are expected at Illuminotronica 2016. A unique occasion in Italy to be updated, develop business, meet lighting experts, know home automation technologies, focusing on solutions and products for the wellbeing and security of people. 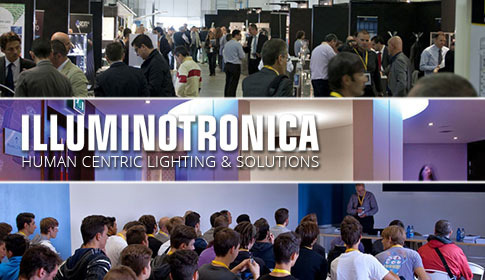 Illuminotronica 2015 has known another edition of growth. The 2016 event is expected to be even larger than the previous edition. In human beings, sight is the most important sense. Responsible for the reception of visual stirrings, it allows people to recognize shapes, light and colours and is at the basis (for the 80%) of what we learn and know every day. The perception is instead the interpretation of what is happening around us through sensorial stirrings, and it is something subjective and personal. These concepts of sight and of perception are the key points of Illuminotronica 2015, the unique professional event in Italy which is focused on light, in all its aspects. Promoted by Assodel, (Italian Association of Electronics Cluters), the event presents and proposes the latest solutions and smart lighting technologies for the comfort and well-being of sight (with LIGHTING) and for safety of perception (with SMART HOME). 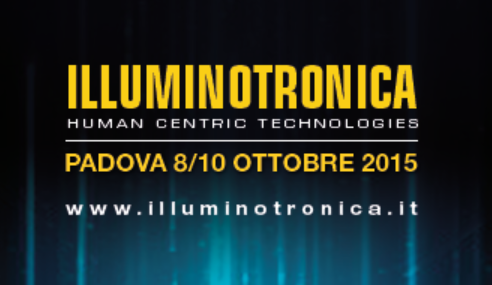 Illuminotronica 2015 is next to the Euroluce 2017 and Lumen Fortonic Forum a ‘must-attend’ event in lighting Italy!